So you think you know all about vampires? You could recognise one right off and know how to deal with it? Guess again! Vampires are much more complex creatures than either Buffy or Twilight or those scores of other movies and television shows would have you believe. Even in somewhere like America. American vampire lore has its roots in the beliefs and fears of the diverse peoples and nationalities that make up the country and reflects the rich tapestry of their varied perspectives. Therefore the vampires that lurk in the American darkness come in a variety of shapes and sizes and can produce some surprising results. The vampires in North Carolina for instance are vastly different to those in South Carolina who are in turn different from those in New York State. And maybe they're not all human in form or can be dismissed by the sight of a crucifix or a bulb of garlic. Would you sit in a vampire chair for instance or drink from a vampiric well? 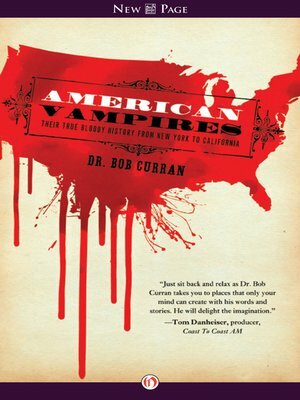 In a fascinating book on the subject, Dr. Bob Curran looks at vampires across the American continent, tracing the cultures and perceptions that have created the Undead in their specific regions. He visits places such as the Louisiana bayous; the back streets of New York, the hills of Tennessee, even the Sierras of California, the deserts of Arizona and many more locations in a bid to track down the vampire creatures that lurk there. Why not join him if you dare! Still think you know American vampires? Don't be so sure!